In part nine of our 10-part Beatles Interview Series, we continuing exploring the break up of The Beatles. First, we will look at the opening shot, which was fired by Paul in the press release for his advance, promotional copies of his first solo album, McCartney, from April 9, 1970. Jay Spangler of The Beatles Ultimate Experience writes, "While John Lennon had privately left the Beatles months earlier, it was from this interview that the story of a Beatles' split spread instantly as news headlines around the world. 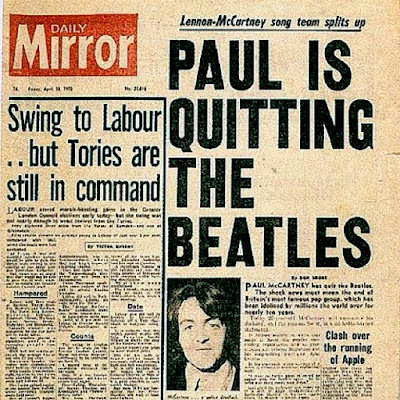 On April 10th, the Daily Mirror ran a front-page story with the bold print headline, 'PAUL IS QUITTING THE BEATLES,' while CBS News in America declared, "The Beatles are breaking up." PAUL: "Even if it isn't, I will continue to do what I want, when I want to." PAUL: "Time will tell. Being a solo album means it's 'the start of a solo career...' and not being done with the Beatles means it's just a rest. So it's both." Q: "Do you foresee a time when Lennon-McCartney becomes an active songwriting partnership again?" With the public still reeling from the news of a Beatles split, George Harrison took a quick trip to New York City in May, and was interviewed by WABC-FM radio's Howard Smith. Below you will read a snippet from that interview. Q: "You think the Beatles will get together again, then?" GEORGE: "Uhh... Well, I don't... I couldn't tell, you know, if they do or not. I'll certainly try my best to do something with them again, you know. I mean, it's only a matter of accepting that the situation is a compromise. In a way it's a compromise, and it's a sacrifice, you know, because we all have to sacrifice a little in order to gain something really big. And there is a big gain by recording together -- I think musically, and financially, and also spiritually. And for the rest of the world, you know, I think that Beatle music is such a big sort of scene -- that I think it's the least we could do is to sacrifice three months of the year at least, you know, just to do an album or two. I think it's very selfish if the Beatles don't record together." Q: "But everything looks so gloomy right now." GEORGE: "It's not, really. You know, it's no more gloomy than it's been for the last ten years. It really isn't any worse. It's just that now over the last year -- what with John, and lately with Paul-- everything that they've thought or said has come out, you know, to the public. It's been printed. It's been there for everybody to read, or to comment about, or to join in on. Whereas before..."
Q: "But the things...The feelings had been there all along?" GEORGE: "No, I wouldn't say that. In different ways, you know. We're just like anybody else. (laughs) Familiarity breeds contempt, they do say. And we've had slight problems. But it's only been recently, you know, because we didn't work together for such a long time in the Yoko and John situation. And then Paul and Linda. But it's really... It's not as bad as it seems, you know. Like, we're all having a good time individually, and..."
Q: "There seems like there's so much animosity between Paul and..."
Q: "You know, you three... I mean, it sounds like he is saying it's all over." GEORGE: "But it's more of a personal thing, you know. That's down to the management situation, you know, with Apple. Because Paul, really -- It was his idea to do Apple, and once it started going Paul was very active in there. And then it got really chaotic and we had to do something about it. When we started doing something about it, obviously Paul didn't have as much say in the matter, and then he decided... you know, because he wanted Lee Eastman his in-laws to run it and we didn't. Then that's the only reason, you know. That's the whole basis. But that's only a personal problem that he'll have to get over because that's... The reality is that he's out-voted and we're a partnership. We've got these companies which we all own 25 percent of each, and if there's a decision to be made then, like in any other business or group you have a vote, you know. And he was out-voted 3 to 1 and if he doesn't like it, it's really a pity. You know, because we're trying to do what's best for the Beatles as a group, or best for Apple as a company. We're not trying to do what's best for Paul and his in-laws, you know." Q: "You think that's what the key fight is over?" 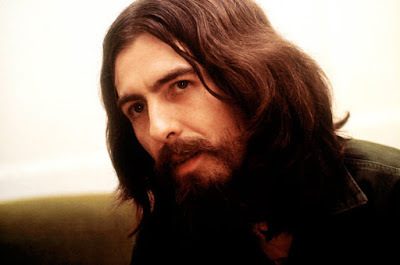 GEORGE: "Yeah, because it's on such a personal level that it is a big problem, really. You know -- You imagine that situation if you were married and you wanted your in-laws to handle certain things. You know, it's like -- It's a difficult one to overcome because... well, you can think of the subtleties, you know. But he's really living with it like that, you see. When I go home at night I'm not living there with Allen Klein, whereas in a way, Paul's living with the Eastmans, you see. And so it's purely... it's not really between Paul and us. You know, it's between Paul's advisors who are the Eastmans and our business advisors which is Allen Klein. (pause) But it's alright." Q: "Aw, I don't know!" Q: "I'm not as optimistic." GEORGE: "Yeah, it's alright. All things pass... away... as they say." Q: "I somewhat detected some kind of animosity between Yoko and Linda. Is that part of what it's about?" GEORGE: "Ahh, I don't know. I don't think about it, you know. I refuse to be a part of any hassles like that. You know, Hare Krishna, Hare Krishna. Krishna, Krishna, Hare, Hare. And it'll all be okay, you know. Just give 'em time because they do really love each other, you know. I mean, we all do. We've been so close and through so much together that it really... to talk about it like this, you know, we'll never get any nearer to it. But the main thing is, like in anybody's life, they have slight problems. And it's just that our problems are always blown up, and uhh, you know, shown to everybody. But it's not really... it's not a problem. It's only a problem if you think about it." Q: "So you don't think there's any great anger between Paul and John?" GEORGE: "No, I think there may be what you'd term a little bitchiness. But, you know, that's all it is. It's just being bitchy to each other, you know. Childish. Childish."